Updates are important for every OS or software installed on a system but sometimes, it can unsettle your computer. Well, Windows updates hardly cause trouble for your system but when they do, it hurts a lot. 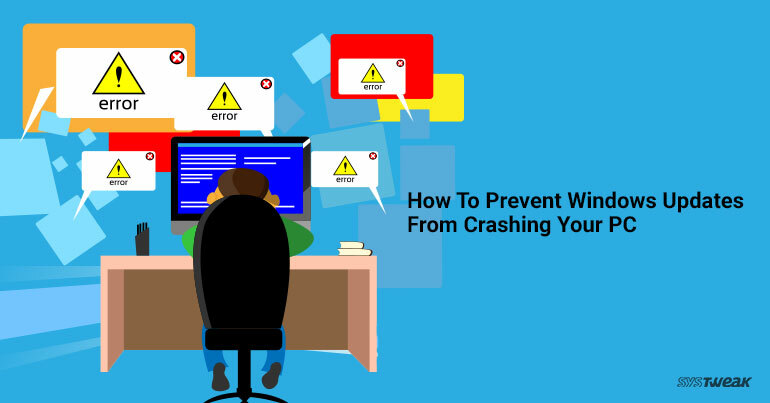 In this article, we will discuss some really simple ways to prevent Windows updates from crashing your PC. Always, always backup your data as you never know, when your system would crash. You can backup your documents, music, videos to external drive or memory stick to keep it safe. You can also back it up using an online backup service. Go on the Start button ->Settings. Under Settings, choose Update & security. You can choose the preference accordingly. The system should always have at least 20% of the total size of the drive. Space is needed for Windows and other programs to expand, during installation and recovery processes. Precisely, it is needed for System Restore, which is the primary recovery process if a Windows update causes a glitch. Plug In Your Computer If It’s Not Already. Well, if you are on a desktop, it is already plugged in. But, if you are working on a laptop or a tablet, you need to plug it in before installing updates. As, if the system shuts down in between installing updates, it might corrupt the files updated or worse, it might crash the system. Before installing the updates, make sure you restart your system properly. Restarting your computer regularly will remove the unnecessary background processes and speed up the system. It is always good to take precautionary measures, creating restore point is one of them. Create a restore point before installing the updates. Well, Windows Update creates a restore point automatically before installing any patches you select but if you want to create one too, there is nothing wrong in adding an extra layer of protection. Before applying updates, you should disable your Antivirus software as it can create issues while installing Windows updates. So, disable the real time protection mode before starting the process. As you are done with all the precautionary measures, it is time to install updates. Never apply all updates at once. Install updates one by one followed by a restart. Note: Don’t forget to disable Antivirus program after every restart. So, these are ways to prevent windows updates from crashing your PC. We hope, we have covered all but if we have missed something, do let us know in the comments.